Combine the habanero, lime juice and mint in a mini-food processor or blender and blend until smooth. Season with the salt and pepper. 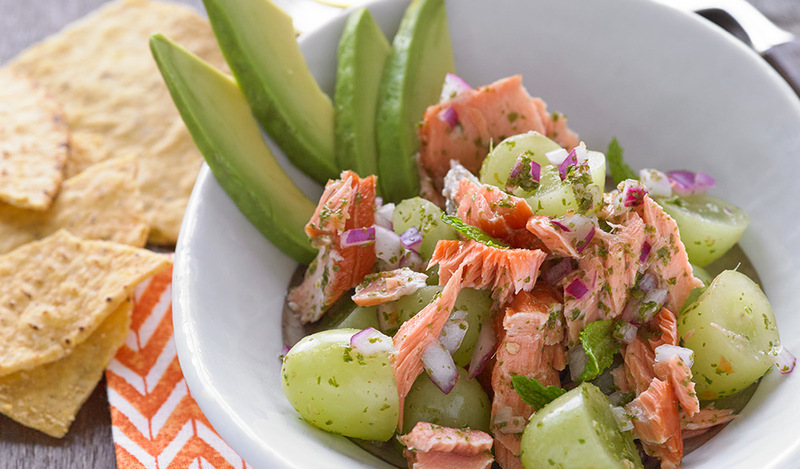 Mix the salmon with the habanero dressing, grapes, onion and coriander seed. To serve, divide salmon mixture among four bowls and serve with avocado slices and tortillas. Garnish with additional mint. Nutritional information per serving: Calories 290; Protein 17 g; Carbohydrate 23 g; Fat 16 g (50% Calories from Fat); Saturated Fat 3 g (9% Calories from Saturated Fat); Cholesterol 40 mg; Sodium 600 mg; Fiber 6 g.